It's not just another fish story! We really have the best fishing guides around. Guides will benefit seasoned fishermen and those just getting their line wet. Guide service operating out of Sunriver, OR. Offers guided tours and fly fishing school. Also serves as an outfitter for outdoors trips. Guided fly fishing trips on a wide variety of water near Bend Oregon. We fish the Deschutes and Crooked rivers, as well as a number of lakes. Fly-fishing guide and gear service for trophy fishing adventure, locally or abroad! Demos, instruction, River-cam, plus shopping online or in our showroom. Offers one to five-day trout and steelhead fishing and float trips down the famous Lower Deschutes River as well as trips on the Owyhee River in eastern Oregon. 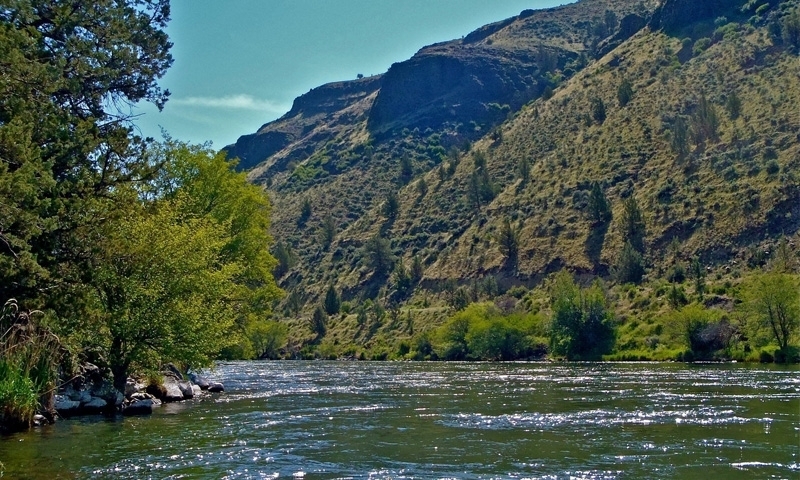 Learn to fly fish on the famous Deschutes River. Featuring beautiful Redside and Steelhead salmon. Get involved in the majestic Oregon outdoors! Educational and recreational opportunities abound. Information on fishing, hunting, and conservation. We are a Bend, Oregon fly fishing guide service. Offering half, full, and multi day adventures on the Deschutes and Crooked Rivers for "Wild" trout and steelhead! We lead quality rafting, kayaking, fishing and instructional river rescue and training programs. Featuring the Deschutes River, Oregon! Sports and outdoor lovers flock to this retreat along the Deschutes River. Plenty of summer and winter recreation right close by. A wilderness paradise! One of the most popular fly fishing rivers in the country. Over 250 miles long, the beautiful Deschutes River flows right through the heart of Bend. Renowned for some of the best whitewater rafting in Oregon, the Deschutes River has everything from mild Class I to treacherous Class VI rapids. The 250 mile Deschutes River in Oregon is considered by many to be a river of contrasts. Known for some of the best whitewater rapids in Oregon, the Deschutes River offers rafters and kayakers Class I to Class V rapids, as well as several stretches of treacherous Class VI rapids. Early 18th century French fur traders called it the “Riviere aux Chutes” which means “river of falls”. One of the mighty Columbia River’s major tributaries in Oregon, Deschutes River was once used by Native Americans to go back and forth from the Columbia. This beautiful river is also a renowned fly fishing destination. The Deschutes River, OR, winds through Central Oregon. It originates 90 miles south of Bend at Little Lava Lake and flows through Bend, making its way to the Oregon-Washington border, where it converges with the Columbia River. Fly Fishing – The Deschutes River is a popular destination for fly fishing. A unique strain of rainbow trout that is found only in Central Oregon resides in the river. Locals call these trout with the bright red band “redsides”. Whitewater Rafting – The Deschutes River, Oregon, attracts whitewater enthusiasts from all over the country. The stretch of water between Bend and Wickiup Dam is 53 miles long and offers a range of rapids, including several in the expert-only Class 5 category. Milder Class I rapids comprise most of the river’s lower 100 miles, where it winds through scenic canyons up to 2,200 feet deep. Unlike most U.S. rivers, the Deschutes River flows north. Special fishing permits are required to fish the Deschutes from the Warm Springs Reservation. At Benham Falls, about 19 miles from Bend, the river varies between Class IV rapids to Class VI waterfalls. Like the Deschutes, the Salmon River in Idaho is famous for fishing and rafting.